On a recent trip around Europe with a necessary detour to England, this writer spent quite a while working out the best way to get from one of the cities in Europe to Bath in UK. A Eurail ticket for the trains was already decided and various options were possible – fly from Paris or Berlin to Bristol or Exeter, all of which were tossed aside when it was too expensive (small airports in Bristol and Exeter), few flight choices and the uncertainty of excess baggage charges on low cost airlines that would ensure nothing extra was added to our luggage. Our other choice was a Stena Line ferry between Holland and England which would also take care of our pile of luggage. When making our Eurail booking – you purchase the pass first, you can make reservations later if you need to- a screen popped up offering a generous discount on Stena Line tickets as long as out Eurail pass was still valid. That sealed the deal and made it much easier to add a day in Amsterdam into the mix so we could catch the overnight Stena Line ferry from Hook of Holland to Harwich. From there it was an easy job to book train tickets well in advance, straight to Bath. You can also book direct with Stena Line – they have a number of offers on their site, including sail and rail options. The other advantage of taking the ferry, if it’s an overnight trip, is that you can count that as a night’s accommodation. The boarding time for your ferry will be advised on your ticket, so make sure you reach the Terminal early enough to pass through the Immigration and Security checks. 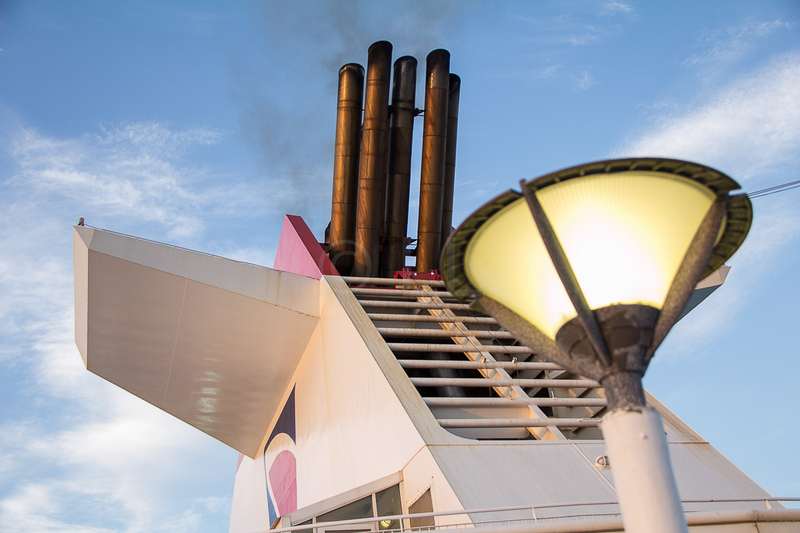 Services in the Hook of Holland Terminal are limited, so board as soon as you are able, to enjoy the facilities on board. 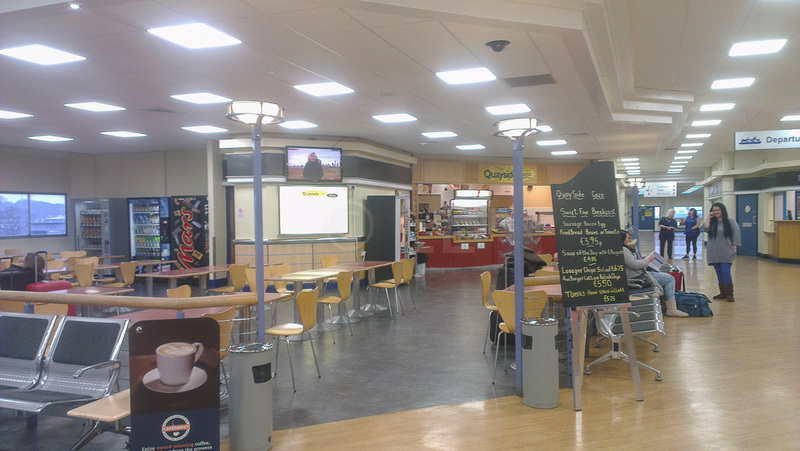 At the Harwich Terminal, there is a small coffee shop, but they only serve snacks and drinks, hot and cold. 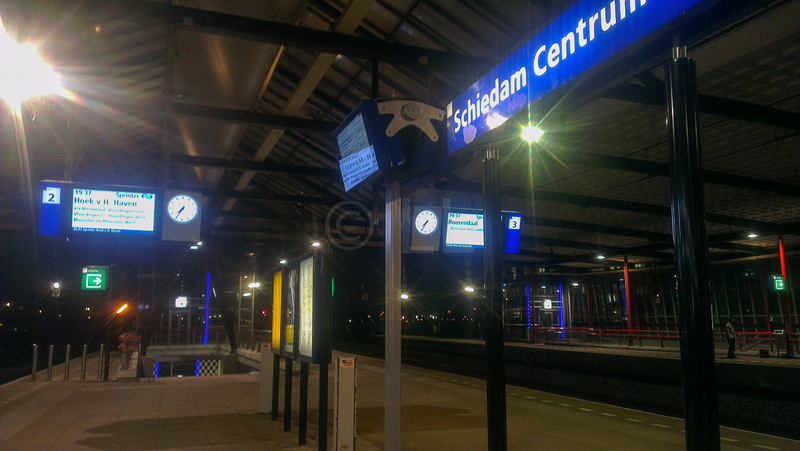 We caught the train from Amsterdam Central and depending on the type of train you catch and route you choose, you will need to change trains at some point. There is not a direct line from Amsterdam. 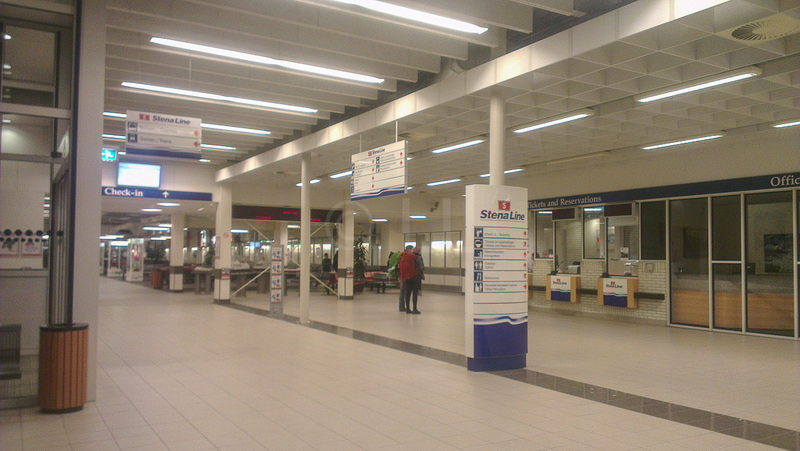 We changed at Schiedam Centrum. The time taken also depends on the type of train and number of stops, so check the timetable beforehand. From the station to the terminal is a short walk under cover. **Tip – A small convenience store to the right of the platform entrance of Amsterdam Central Station has a handy variety of dairy and bakery products as well as a self-service coffee machine. Breakfast problems solved! 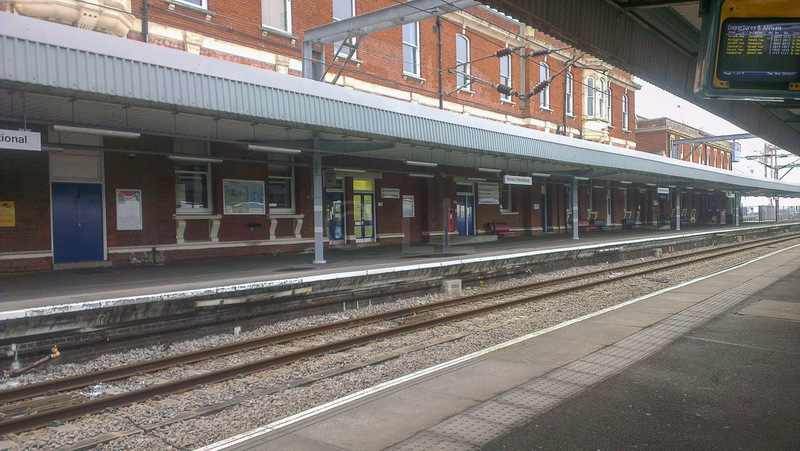 The Harwich railway station is connected to the ferry terminal. Again, the connection is covered and there are lifts, escalators and stairs for access. Trains run regularly to London Liverpool Street Station, both direct and some services which require a change at Manningtree (it’s the same platform and the train terminates there). If you are planning to connect onward from London, it’s a good idea to purchase your ticket online as one booking. The ticket will include any London Underground service you may need (e.g.Liverpool Street to Paddington) will be included in your ticket. Underground tickets are very expensive if you have to buy them separately. Instructions on our ticket weren’t clear about what time boarding began, so even though we arrived at the terminal in Hook of Holland quite early, there was nobody around to ask if we could board. Apparently you can board early, but even the immigration counters didn’t seem to be manned, so we sat for at least an hour waiting for some announcement. Only when others showed up we decided to all make our way to the Immigration controls, which were quite quick and easy and we then made our way onboard. Finding our cabin was not difficult as we had the Deck and cabin number on our printout and there is a lift as well as stairs close to the boarding entrance. There are staff members in attendance to assist. Sailing time was 10pm, so we went for a quick look around, hoping to find a spot on deck to watch our departure. Unfortunately, it was very cold and windy so staying on deck was not an option, especially as the deck was not well lit and we were unable to find any signs directing us to any useful (and protected) vantage point. Neither was there any place we could find to sit and have a drink and watch through windows as all the shops, cafes and bars at least in our part of the ship were closing for the night. Apparently there is a cinema in the section we were in and a casino, bar and restaurant in the fore section of the ferry, but the lack of clear and obvious signage meant we didn’t manage to find them. The restaurant does open early in the morning for breakfast, but as we were due to disembark at 6.30 we felt it was not worth rising early enough to eat an early breakfast and we’d brought food with us anyway. We did check the online menu for choices and pricing and this was one of the factors in our choice of bringing our own breakfast. We decided to take one of the more expensive choices, a Family 3 Berth Outside Cabin which is suitable for up to two adults and a child as we wanted to see the view. 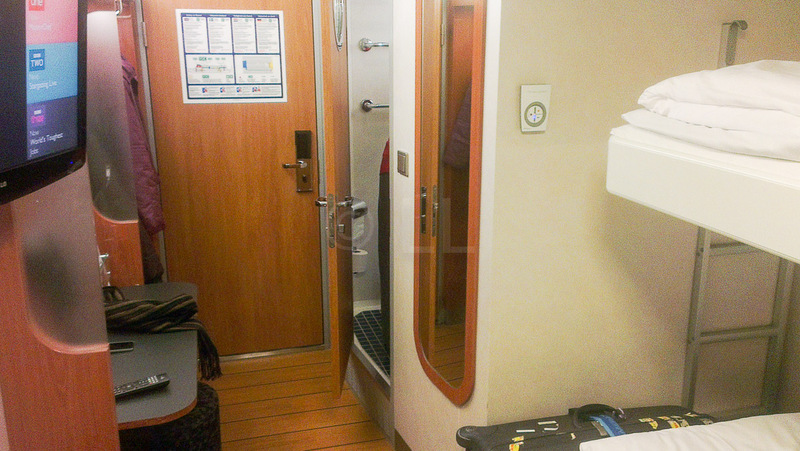 There are limited options for outside cabins and this was the least expensive option. The beds are arranged along one wall, a double bed below a single wall mounted upper bed. We found the bed comfortable and were not aware of any movement – it was really like sleeping in a hotel on land. Linen and a duvet are included. We found the ensuite bathroom compact but spacious enough for one at a time to use the sink and it comes with toilet, sink and shower, with provided towels and toiletries. The flat screen satellite TV has a range of channels available and is also used for in-ship announcements, including information about the time difference between the two countries. It’s wall-mounted above the dressing table/desk, which has a generous sized mirror and good lighting. There is open hanging space with hangers and luggage space inside the door and a phone for internal calls. 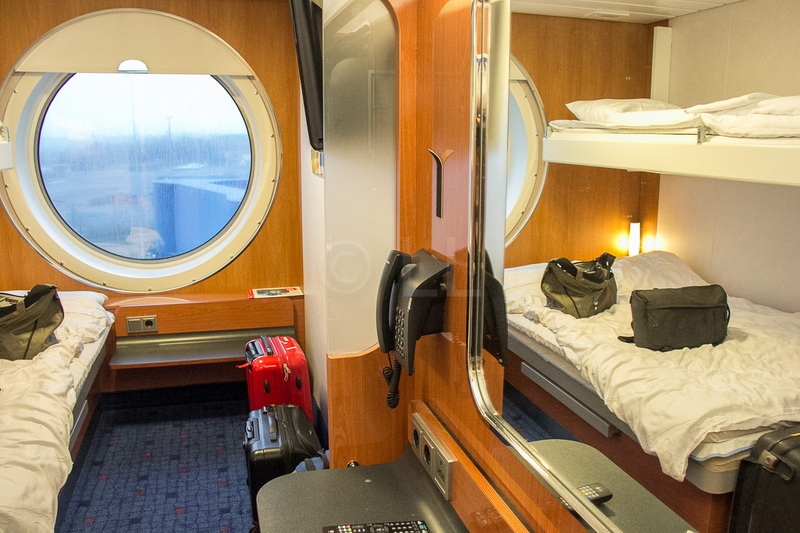 The porthole is large with quite a wide inside window sill, useful for phones and alarm clocks etc. Sadly there wasn’t a lot to see. By the time we awoke, we had already docked and it was a rather cloudy miserable day with condensation on the window making it difficult to see outside – there was no beautiful sunrise to admire. Possibly, though an inside, less expensive cabin would be just as good, given that there’s nothing to see anyway. A daytime trip may also be a good option as you are not required to book a cabin (this is mandatory for the night sailings) and you’d have time to enjoy the facilities on board. You can download a .pdf version of the ship map from this page and facilities information, but despite having this available, we found the signage to be poor which possibly explained why we were unable to locate any of the facilities, including a cinema, casino and restaurants that were apparently still open when we were looking for them.